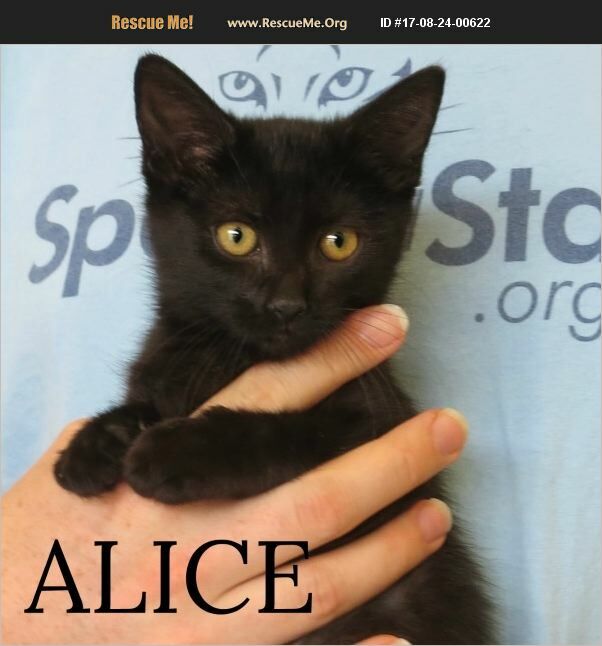 Alice (about 12 weeks old as of 8/24) is a black female shorthaired kitten. Alice was rescued from the inside of a car engine as a small kitten. This little stowaway had some stowaways of her own though; as one of the few poor kittens we've ever found covered with lice her foster mom just couldn't resist naming her Alice because she was All-Lice! Thankfully after some parasite treatment Alice is a healthy, happy girl who equally loves playing with other kittens and getting attention from people. She tolerates the small kids in her foster home well, is getting used to having a dog around, and loves other cats so much she figured out how to unzip and break -in- to another crate to cuddle with a kitten friend! She is a very social girl who will thrive best with another feline. Our adoption fee for kittens under 6 months old is $125 or 2 for $200, which includes them getting fixed (Alice will be fixed in the next few weeks when she makes weight), microchipped, tested for FIV and FeLV, and up to date on vaccines. If you would like to meet a variety of our kittens, many not listed here yet, please check out our regular adoption events, Sundays from 12-4 at the Vernon Hills Petco!